The way you spend your time in the morning sets the tone for how the rest of your day will unfold. If you wake up feeling frazzled and hurried, then you’ll continue to bring that overwhelm and anxiety with you through the day. With all the commitments we have, it’s easy to wake up, quickly prepare for the day, and then do whatever we must do on our to do list. Each day we wake up and usually follow a similar routine. If we put the to do list first, it can be easy to feel rushed in the morning and feel like there’s just not enough time to do anything other than get ready and go. Most of us jump out of bed and think of all the things we must do. This can leave us feeling anxious and overwhelmed, which is not the ideal way to start your day. But if we can slow down and start to infuse our morning’s with a bit more meaning, it will have a ripple effect on the rest of our day. By taking even just five to ten minutes to start a morning ritual that helps you slow down and tune in with yourself, you’re creating the space to stay centered and grounded. Get started with these three easy and simple morning rituals that you can incorporate into your routine. Drinking a room-temperature or warm glass of water with a slice of lemon every morning is one of the best habits you can create for yourself. As you sleep, your body is working hard to detoxify your systems and cells. The first thing you put in your body in the morning matters, and it’s great to give your body an extra boost. Water with lemon is a great way to signal to your body that the day has begun and also to help flush your digestive system of any toxins your body is ready to release. This is a great way to start each day and it’s an easy and simple habit to start. Even if you have to walk the dog or take care of children, you can pre-cut your lemon slices and store them in the fridge. Just pour a glass of water, add in lemon and enjoy. It takes less than a minute and will help you start each day with putting yourself first, even if it’s just a simple glass of water. 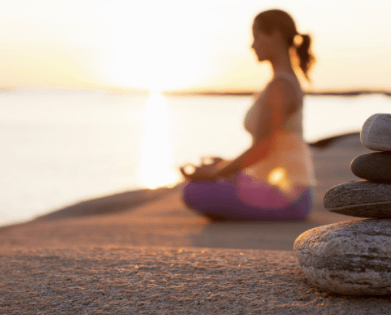 Even five minutes of meditation each morning can change your entire outlook on the day ahead. By slowing down and tuning in, you’re giving your mind a rest and letting your higher self step forward. The practice of meditation can happen in many different ways—whether you try deep breathing and mindfulness, listen to a guided meditation, or meditate while you walk, run, bike or drive. The possibilities are endless. Additionally, ending each meditation session with gratitude is a wonderful way to put yourself in the right mindset moving forward. Keep a gratitude journal and make a list of at least 3 things you’re grateful for everyday. Really feel the gratitude and focus on all that’s good in your life. This will stay with you in the day ahead, and help you keep a more positive mindset. One of the best ways to clear your mind each day is to take a morning stroll. Whether it’s 10 minutes around the block or an hour, wake up a little earlier and find the time to walk and stretch your legs, preferably in nature. By getting out and moving first thing, you’re waking up all your muscles and giving your mind some time to get clear. Walking is also a wonderful form of exercise, so if you make it a habit each morning, you’re giving yourself the relaxation and the movement you need. It’s a total win-win. Something is better than nothing, so even if it’s just a 5 minute stroll around the block—that’s a start! 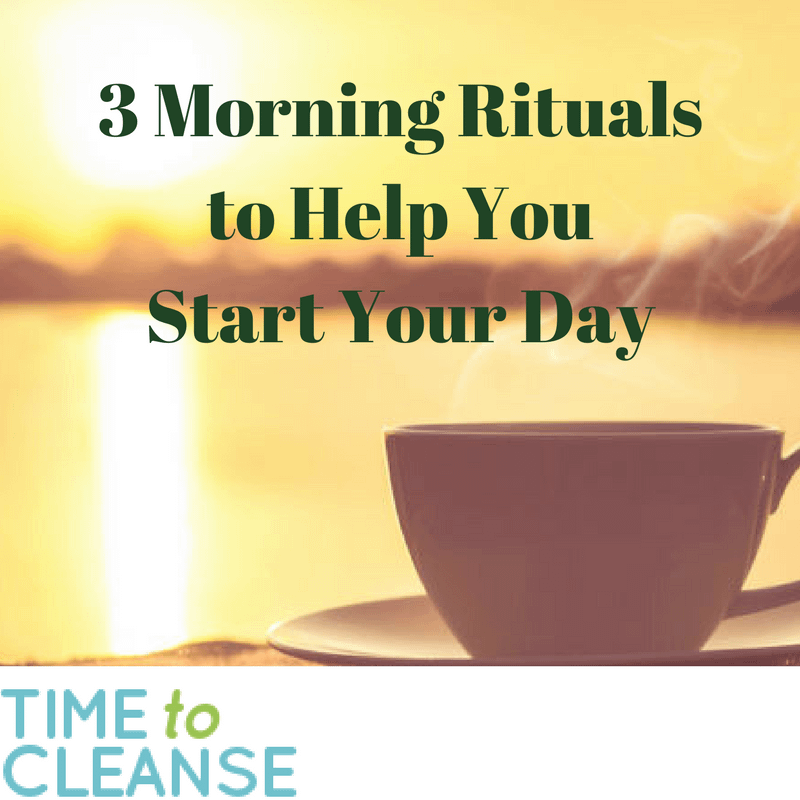 Once you try working these three different rituals into your morning, you’ll see results in how you feel. A big part of cleansing and detoxing is physical, but another portion has to do with your mental state. All of these things will only help and assist you as you move forward on your journey of wellness and health.